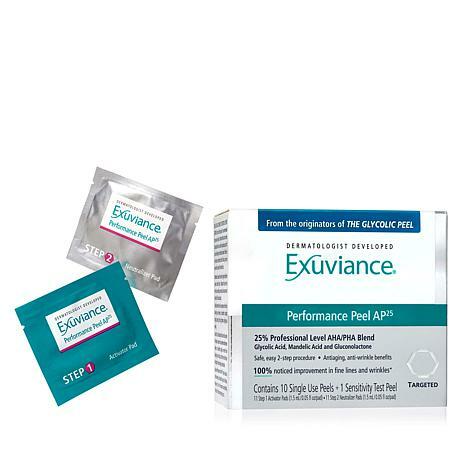 Professional-level peel containing a 25% blend of alpha hydroxy acids (AHAs) and polyhydroxy acid (PHA), correctly balanced at the optimal pH to maximize performance and minimize irritation potential. This kit contains a 5-week supply, including two tester pads. In an ophthalmologist-graded test for eye area safety with 31 subjects using the Performance Peel AP25 twice weekly over 4 weeks, the product was determined to be safe for use on the skin and around the eye area. Cleanse the face with a gentle, effective cleanser. Apply a Step 1 Activator Pad over the entire face, avoiding eye area, lips and any area of sensitivity. Then discard pad. Carefully monitor the skin's response to the peel by observing any redness or discomfort, including stinging, burning, itching, tightness, tingling and peeling. Apply a Step 2 Neutralizer Pad to the face after 10 minutes, or sooner if you experience bothersome redness or discomfort. Apply over entire face (avoiding eyes and lips), and then rinse the face thoroughly with water. You may leave the (Step 1) Activator Solution on your skin for up to, or as long as 10 minutes, and no longer than 10 minutes. Some people may experience some bothersome dryness or stinging during the 10 minutes time frame the activator solution is on their face. For those skin types we suggest applying the (Step 2) Neutralizer Solution earlier than 10 minutes, or as soon as you experience the stinging sensation if you find it bothersome. As with all hydroxy acid peels, a slight tingling sensation is expected, but if this sensation is too much, we recommend neutralizing the peel sooner than the total 10 minutes time. 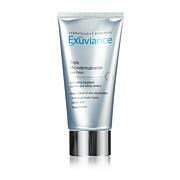 Reduce frequency of use if skin becomes uncomfortable, irritated or if bothersome peeling occurs. Ingredients: Step 1 - Activator Pads Ingredients: Aqua (Water), Mandelic Acid, Glycolic Acid, Gluconolactone, Ammonium Hydroxide, Arginine, Butylene Glycol, Glycerin, Sodium Bisulfite, Chlorphenesin, Methylparaben. Step 2 - Neutralizer Pads Ingredients: Water, Glycerin, Propylene Glycol, Sodium Bicarbonate, Glycine, Benzalkonium Chloride.